Stock photo of view of the fountain from the central building in Plaza de Espana, Parque Maria Luisa, at dusk in the City of Sevilla (Seville), Province of Sevilla, Andalusia (Andalucia), Spain, Europe. A view of the fountain can be seen through the beautifully detailed archways in Plaza de Espana. 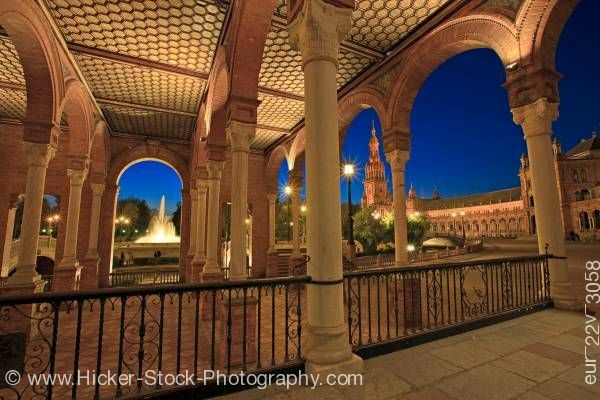 This stock photo shows an evening view of the fountain from the central building in Plaza de Espana, Parque Maria Luisa, in the City of Sevilla, Province of Sevilla, Andalusia, Spain, Europe. A view of the fountain can be seen through the beautiful archways of the canopy. Several round columns with detailed caps support the archways. The tiled ceiling looks like honeycomb. A black wrought iron railing with swirls between the posts is added to the outside columns. A view of the cathedral and its bell tower can be seen to the right. The stone walkway and black lamp posts leads to the cathedral. A small curved bridge can be seen through the archways to the left of the fountain. View of the fountain from the central building in Plaza de Espana, Parque Maria Luisa, at dusk in the City of Sevilla (Seville), Province of Sevilla, Andalusia (Andalucia), Spain, Europe.